A colour divided back postcard. It is dated 28 May 1925. This is the same image, with the same sailing vessel in the lower right corner, as was used with the Niagara Navigation Company fleet when it included CHICORA. The original image dates from around 1907. 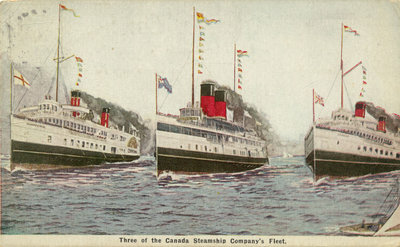 "Three of the Canada Steamship Company's Fleet." Reverse: "Published by Gardiner, Thomson & Bowles 249 Spadina Avenue Trinity 6682."